The 303 Automotive Polish Step 2 helps you remove light to medium imperfections with ease! Our vehicles do not sit in the garage 100% of the time, we take them out and enjoy them on the road. When driving road debris, dirt, grime, car washes, etc. can do a number on our paint. From very fine scratches to swirls and oxidation, these imperfections take away from the overall clarity of your paint. Using a polish will help you remove these imperfections, bringing clarity back to the surface. 303 has a simple three step polishing system that will help you remove imperfections and leave your paint looking amazing. All three polishes can be applied by hand or with your favorite buffer (ie rotary, dual action, orbital, long throw, forced rotation, etc.). All three polishes can be used on single stage paint and modern dual stage clear coats. Best of all there is no dusting so clean up is much easier with these polishes. Step 1, The Automotive Compound, is a strong compound that helps remove 1500 grit scratches, swirls, oxidation. 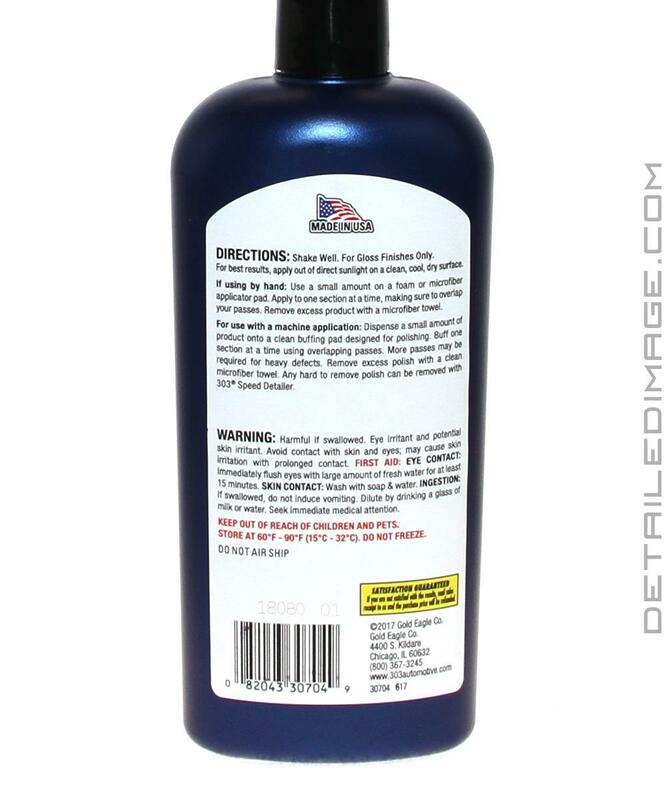 Use this to spot treat noticeable fine scratches or restoring paint that hasn't been polished in a while. Step 2, the Automotive Polish is designed to remove lighter imperfections, swirls, etc. and can be used as a follow-up to the Compound, or as a one-step polishing option. This is a more common starting point for most daily drivers with lower miles that only have moderate imperfections. The formula has a long work time and does not dust. It can make the paint look and feel like new again. The last step, step 3 in the system is the Finishing Polish. This product helps to remove very light blemishes, hazing, swirls, etc. It is designed to be the last step in the process or a single step if you have very minimal imperfections. After use you will be left with a nice clear paint surface, ready for a layer of protection. 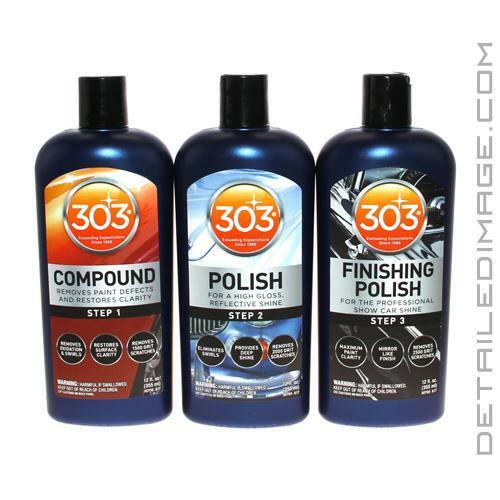 Whether you are using 1, 2 or all 3 of these polishing products, 303 has you your polishing needs covered! Shake Well. For Gloss Finishes Only. For best results, apply out of direct sunlight on a clean, cool, dry surface. If using by hand: Use a small amount on a foam or microfiber applicator pad. Apply to one section at a time, making sure to overlap your passes. Remove excess product with a microfiber towel. For use with a machine application: Dispense a small amount of product onto a clean buffing pad designed for polishing. Buff one section at a time using overlapping passes. More passes may be required for heavy defects, Remove excess polish with a clean microfiber towel. 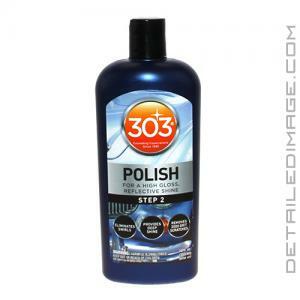 Any hard to remove polish can be removed with 303 Speed Detailer. Such an overlooked product. Right on par with Meg. 205 and Menz. 2400/2500, but much easier to work with. Long working time, 0 dust, and so easy to wipe off. Meg. 205 seems a bit thin and can sling, Menz. 2400/2500 is thicker and cake up your pads, this does neither. This seems to have all the best qualities of both 205 and 2400/2500. Wish they came in bigger bottles so you could get a little better value, as the current price/Oz. is a bit higher then Meg. and Menz.